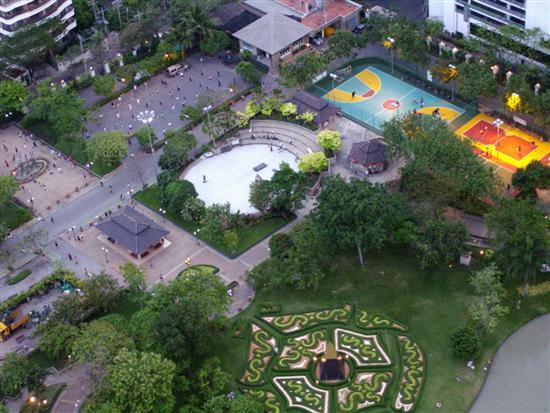 Benjasiri Park (Suan Ben) is located next to the Emporium Shopping centre near the Phrom Phong skytrain station and it epitomises what a park should really be. 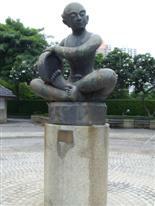 It is a place where people can go and relax take some time out of their day and unwind. You can see in the aerial picture that at the top left is the aerobics class with all the people in formation. You don't have to pay to attend this, just put on your dancing shoes and join in. It starts around 6:00pm daily. At the top right is the 5-aside soccer pitch and to the right of that is where they kick that little rattan ball over the net. It's a little like tennis really, but with your feet. This is a real game of skill and you will have some fun watching this. Centre left is the skateboard park, all sorts of tricks and acrobatic stunts go on here. Just for the young and young at heart. Further to the left is the pond and the gardens. At either entrance to the park is a small kiosk. Buy a loaf of bread at the kiosk and feed it to the fish. There are some monster catfish in this pond, and I am not surprised seeing how much bread they are fed. Loaves and loaves of it go into that pond each day. There are public swimming pools all over Bangkok, but if you don't know where to look then they can be difficult to find. After you have been provided with your membership card you can swim in the pool for 15 Baht during one of the following sessions. The 6-lane pool is 12.5m x 25m and there are unconfirmed reports that it is necessary to wear Speedos! 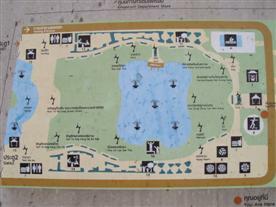 Towards the rear of the park near to the swimming pool entrance you will find a Benjasiri Park Map mounted on a small pedestal. 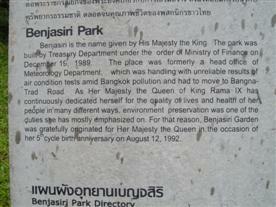 Benjasiri Park is located in the heart of Sukhumvit and adjacent to the Emporium Shopping centre. 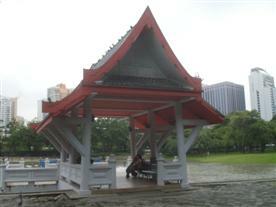 It is a lovely small park that is well used by the locals and in the evening there is a musical fountain show alongside Sukhumvit Road, although the official park website indicate three shows per day. Next time you are in the vicinity stop by and relax. If you like to listen to Buddhist teachings, then every second Sunday from 06:30am - 08:30am you can come and make merit and listen to a sermon. 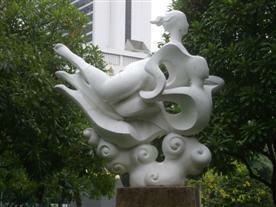 Located at the rear of Benjasiri Park. 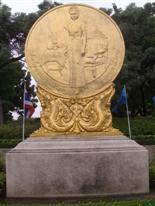 This is a park of sculptures and so scattered around the park are some 18 sculptures and a gold plaque from the Queen. If you are not sure how to get to this park or the Phrom Phong BTS station (E5) then have a look at the BTS map of the Bangkok Skytrain to get your bearings. 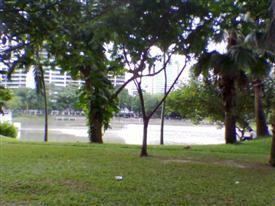 If you liked this park then you might also like Rama IX Park.